Students in school learn about the solar system as part of their science program. Learning to make a hanging mobile model of the solar system can help children to learn the names of the planets and how far away from the sun each planet is. This hands-on experience lets children get creative and design the moving parts of the solar system while they learn. Creating a solar system is a project a child can do alone or as a group activity with other children. Once the mobile is hung up by the child, the sun and the planets can move freely. Locate the center of the piece of cardboard that is a circle by using a ruler to measure the circle in both directions. Mark the center of the circle with your pencil. Draw two lines across the circle using the ruler as your guide. One line should go up and down while the other line goes left and right. The two lines will make a cross shape. Draw nine circles on the circular-shaped piece of cardboard with your compass and pencil. Four circles should be close to the sun, while the other five circles should be farther away. The dot in the very center should represent the sun's location. Apply the tip of your scissors once to each circle that you drew to create a hole through the cardboard. The holes can be arranged in various places on the cardboard to give the planets the look as if they are orbiting the sun. Cut nine pieces of string at various lengths between one foot and six inches long. Push the string through the holes and tie a knot to keep the string in the hole. The remainder of the strings will dangle down. Draw some circles in different sizes on different sheets of the colored paper with your compass. Cut the colored paper into circles to represent the sun and planets. The sun should be yellow or orange in color and the eight planets can be other colors. The ninth hole is for the dwarf planet. Cut a hole into the sun and place the sun in the center of the mobile by tying it to the string. Arrange the planets around the sun using the same method; cut a hole using your scissors and then tie the planet to the string. 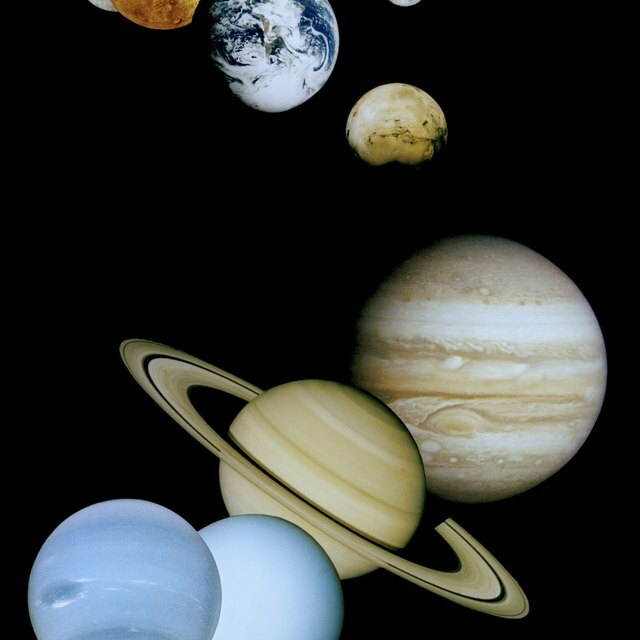 The planets should be placed around the sun in the following order: Mercury, Venus, Earth, Mars, Jupiter, Saturn, Uranus and the outer dwarf planet, Pluto, according to the Enchanted Learning website. Cut three pieces of string all about eight inches in length. Attach the three pieces of string to the top of the mobile and tie them together. Use tape to attach the string to the mobile. Cut one piece of string around six inches long and tie it to the three pieces of string. Use this to hang the mobile up. Slowly rotate the large circle at the top of the mobile with your hand to move the mobile and watch as the planets circle the sun. Reinholz, Angela. "How to Build a Moving Solar System Project for School." Sciencing, https://sciencing.com/build-solar-system-project-school-7738703.html. 25 April 2017.